CITY BUDGET HEARINGS: The City Council continues its executive budget hearings this week. The Council is pushing the de Blasio administration for increased funding on a number of fronts, including for additional police officers and parks, libraries, and more. The parks department budget takes center stage on Tuesday. Meanwhile, the Council is also legislating this week, passing bills through committees and through the whole Council, with a full-body stated meeting set for Wednesday. There will also be new bills introduced on Wednesday, stay tuned and find the details we know thus far below. Mayor Bill de Blasio spent his Monday delivering remarks at a Memorial Day event at The Intrepid Sea, Air, and Space Museum, then marching in the Little Neck-Douglaston Memorial Day Parade in Queens. On Tuesday, de Blasio will be back on Staten Island: he and schools Chancellor Carmen Fariña will visit a classroom and make an announcement at the The Michael J. Petrides School. According to the Staten Island Advance, de Blasio and Fariña will announce that more schools, including some on Staten Island like the high school at Petrides, will be joining the PROSE program that allows certain city schools to implement their own new initiatives that might be outside the teachers union contract. De Blasio is expected to head to Albany Wednesday to talk with legislative leaders about end-of-session priorities. It's going to feel like Monday all day on Tuesday. Last week, "First Lady Chirlane McCray and Mic released a video of the First Lady answering questions she has been asked. From "Which First Ladies inspire you?" to "Are you still a lesbian?" The questions the First Lady answered on video are intended to encourage additional submissions before a live Facebook Q&A, hosted by Mic (facebook.com/MicMedia)...Tuesday, May 26 [at 11 a.m.]. Mental health is the topic of this Facebook Q&A." On Tueday morning's Brian Lehrer Show on WNYC, segments are planned to discuss Albany news with Ken Lovett of the Daily News and the city's new NYCHA plan with Michael Kelly, NYCHA's general manager. On Tuesday at noon at City Hall, "elected officials, advocates, school crossing guards, parents and students will rally on the steps of City Hall to improve working conditions and raise the headcount of school crossing guards across New York City. Specifically, advocates at the rally will call for a much needed 10% increase in the school crossing guard headcount for FY 2016, as well as significant job quality improvements." The effort is being led by Council Members Brad Lander and Vanessa L. Gibson as well as Rosenthal, Cabrera, Menchaca, Cornegy, Deutsch, Lancman and others; plus Manhattan Borough President Gale Brewer, DC 37 Executive Director Henry Garrido, Local 372 President Shaun Francois, Paul Steely White of Transportation Alternatives & Families for Safe Streets, and School Crossing Guards, parents, students, and other community members. 10 a.m: The Committee on Sanitation and Solid Waste Management. Noon: the Committee on Parks and Recreation. (There will be a big parks-related rally at City Hall on Wednesday). 1:30 p.m: The Committee on Environmental Protection. 10 a.m: The Committee on Education meets to discuss a bill that would require the Department of Education to report annually on "progress and efforts toward increasing diversity within schools, including but not limited to, data within charter schools and special programs" and a resolution that the DOE would officially recognize the benefits and importance of school diversity. 11:30 a.m: the Committee on Courts and Legal Services meets to discuss a local law to amend the NYC charter, in relation to creating the Office of Civil Justice. Noon: the Committee on Health meets to discuss a law that would require quarterly reporting from the Department of Health and Mental Hygiene (DOHMH) that includes any physical or mental health performance indicators reported to them by any healthcare provider in jails to be sent to the Mayor's office, and the council's office – while also posting the reports online. 1:00 p.m: the Committee on Transportation will meet to discuss a truck route compliance study, a bill to require a study in relation to pedestrian and bicyclist safety on truck routes, and a law amend the administrative code of the city in relation to side-guards. 2.00 p.m: the Committee on Rules, Privileges and Elections will hear nominations to the Board of Health, the TLC, the Youth Board, and the Board of Correction. At 2 p.m. outside City Hall: "Public Advocate Letitia James will stand with elected officials, advocates, daycare providers, parents, and children to call on the Administration for Children's Services (ACS) to save day care centers. For years, many day care centers have operated with direct leases through the City. Numerous day care centers are now closing as these leases are up for renewal. Public Advocate James and others are calling on ACS to reinstate child care for the capacity that has been lost and to ensure that no additional day care centers are closed." At 6 p.m. on Tuesday, "Brooklyn Borough President Eric L. Adams will induct the new class of members for Brooklyn's eighteen community boards during a ceremony held in the courtroom of Brooklyn Borough Hall; this group includes teenage appointees for the first time, part of an effort he has launched to advance youth involvement in the borough's civic matters." On Tuesday evening at Museum of the City of New York, "Preserving the Fabric of Our Neighborhoods," an event sponsored by the New York Landmarks Preservation Foundation and co-sponsored by a lengthy list of organizations. "Join a group of leading experts as they explore the intersections between historic preservation and affordable housing, portraying how preservation encourages sustainable development and helps to stabilize communities facing financial distress." Panelists include Gale Brewer, Borough President of Manhattan; Ingrid Gould Ellen, Paulette Goddard Professor of Urban Policy and Planning, Director of the Urban Planning Program at NYU Wagner; Ellen Baxter, Executive Director of Broadway Housing Communities;Michelle de la Uz, Executive Director of Fifth Avenue Committee; Simeon Bankoff (moderator), Executive Director, Historic Districts Council. On Wednesday morning at City Hall, City Council Member Costa Constantinides will hold a press conference to announce the introduction of two bills to encourage organ donation. He will be joined by Council Member Ben Kallos; Helen Irving, President & CEO, LiveOnNY, formerly New York Organ Donor Network; Ellen Yoshiuchi, National Program Director, National Kidney Foundation; and Transplant Recipient International Organization (TRIO). "New York State ranks 50th out of 50 nationwide in percent of residents who are registered organ donors. Only 24% of New Yorkers are registered organ donors compared to 50% of residents nationwide." Wednesday morning in Manhattan, City & State will host "Future of Healthcare in New York." The event will include "Back and Forth with Ram Raju, President / CEO of the NYC Health and Hospitals Corporation...Panel of Officials, Advocates and Experts on Major Shifts in Healthcare and Healthcare Delivery: Jason Helgerson, Director of Medicaid and Deputy NYS Health Commissioner; Pamela Brier, President & CEO, Maimonides Hospital; Linda Gibbs, Principal, Bloomberg Associates, Former NYC Deputy Mayor for Health and Human Services...Back and Forth with Dr. Mary Bassett, Commissioner, New York City Dept. of Health." Wednesday morning at Baruch College, the release of "Overcoming the Odds: The Settlement House Advantage and panel discussion on the role of settlement houses in fostering and strengthening individuals, families, and communities, and New York City as a whole" with keynote speaker Lilliam Barrios-Paoli, Deputy Mayor of Health and Human Services and a panel discussion. "Leaders in local government, social policy research, philanthropy, and the non-profit sector will speak on the unique settlement house model—an historical, well-respected approach that is more relevant than ever today. The report being released brings to light 3,000 voices of those who have benefitted from the broad spectrum of integral services provided by settlement houses, such as early childhood education, after school programs, adult education, senior services, community building, and more" - via United Neighborhood Houses. Mayor de Blasio is due in Albany Wednesday for meetings with legislative leaders. At 11 a.m. on Wednesday, Council Member Mark Levine, chair of the Council's parks committee, is helping organize a rally to push for more parks-related funding in the coming fiscal year 2016 city budget. "Please join New Yorkers for Parks, The New York League of Conservation Voters, El Puente, American Society of Landscape Architects, advocates, activists, community gardens enthusiasts and elected officials from across the city for a rally to stand up and fight for our parks." At 10 a.m. the Committee on Mental Health, Developmental Disabilities, Alcoholism, Substance Abuse and Disability Services will meet to pass a resolution for the Governor and the State Legislature to pass two laws that increase the income threshold for the senior citizen homeowner's exemption program, and the income threshold for the disabled homeowner's exemption program. 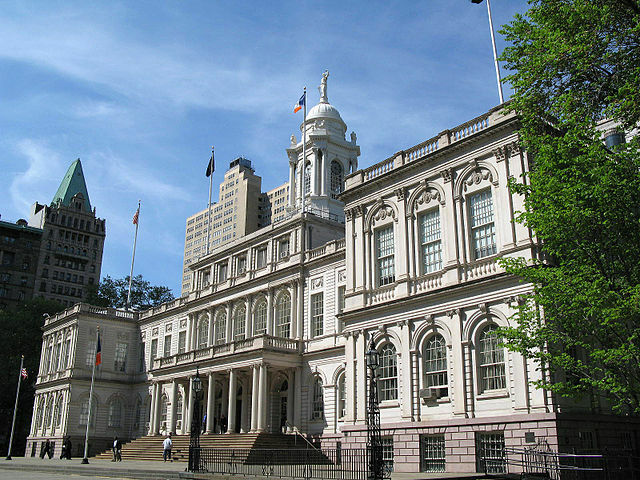 Also at 10 a.m., the Committee on Finance meets on legislation related to the Lower East Side Business Improvement District and a bill that provides a one hundred dollar tax credit to each taxpayer who adopts a dog or a cat from a shelter. At 10:30 a.m. the Committee on Rules, Privileges and Elections will meet to continue its discussion from the prior day and vote on potential board members. And at 1:30 p.m. the City Council will have a full-body Stated Meeting to vote bills through the full Council and see introduction of new legislation. At 11:00 a.m. the Senate Standing Committee on Finance will meet. From noon to 6:00 p.m. at the Legislative Office Building there will be a forum/town hall meeting that will focus on legislation related to issues of privacy, data breach, and appropriate penalties for violations. At noon, the Senate Standing Committee on Commerce, Economic Development and Small Business will meet. At 1:00 p.m. the Senate Standing Committee on Codes will meet. At 1:30 p.m. the Senate Standing Committee on Investigations and Government Operations will meet on a variety of bills. Also at 1:30, the Senate Standing Committee on Children and Families will meet. The Senate is due in session at 3:00 p.m. The Assembly is also due in session on Wednesday. Wednesday evening is Citizens Union's 2015 "Spring for Reform" event. This year it is "a reception celebrating leaders who build communities and strengthen neighborhoods." Honorees include Jack Doyle of New Settlement Apartments; Jessica Lappin of Alliance for Downtown New York; Luna Ranjot of Adhikaar; Tucker Reed of Downtown Brooklyn Partnership; Alexa Sewell of Settlement Housing Fund; and Ben Wellington of I Quant NY. Errol Louis of NY1, the Daily News, and CUNY Journalism School, is a special guest speaker. On Wednesday evening in Brooklyn, City Council Members Brad Lander, Carlos Menchaca and Steve Levin, the D15 Community Education Council, and D15 Superintendent Anita Skop, are "hosting a panel discussion and public forum... Reimagining the Middle School Admissions Process in District 15" at John Jay Campus auditorium in Park Slope. Wednesday evening in Albany, City & State NY is hosting "On 421-A," sponsored by UP4NYC, and dealing with the controversial tax abatement program that, at least in theory, incentivizes developers to build affordable housing units along with market-rate housing. 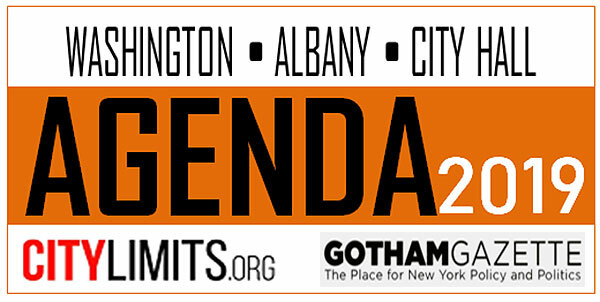 Keynote remakrs by Gary LeBarbera, President of the NYC Building and Construction Trades Council, and a panel featuring LaBarbera, State Senator Diane Savino, ALIGN's Maritza Silva-Farrell, and Assembly Member Francisco Moya (pending confrimation). 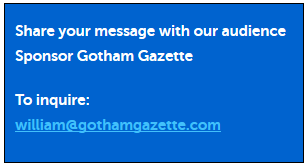 "The next public meeting of the New York City Campaign Finance Board will be held on Thursday, May 28 at 10:00 AM." At 10:00 a.m. the City Council Committee on Education will hold its executive budget hearing. At 1:00 p.m. the Committee on Public Housing, will hold an oversight hearing on "The State's $100 Million Allocation to NYCHA." At 9:30 a.m., several Senate committee meetings: the Senate Standing Committee on Energy and Telecommunications will meet; the Senate Standing Committee on Judiciary will meet; the Senate Standing Committee on Cultural Affairs, Tourism, Parks and Recreation will meet; the Senate Standing Committee on Consumer Protection will meet; the Senate Standing Committee on Transportation will meet; and the Senate Standing Committee on Veterans, Homeland Security and Military Affairs will meet. At 10 a.m. the Senate Standing Committee on Environmental Conservation will meet; as will the Senate Standing Committee on Crime Victims, Crime and Correction. At 10:30 a.m. the Senate Standing Committee on Social Services will meet. At 11:00 a.m. the Senate is due in session. At noon, the Senate Standing Committee on Health will meet. The Assembly is also due in sessoin on Thursday. 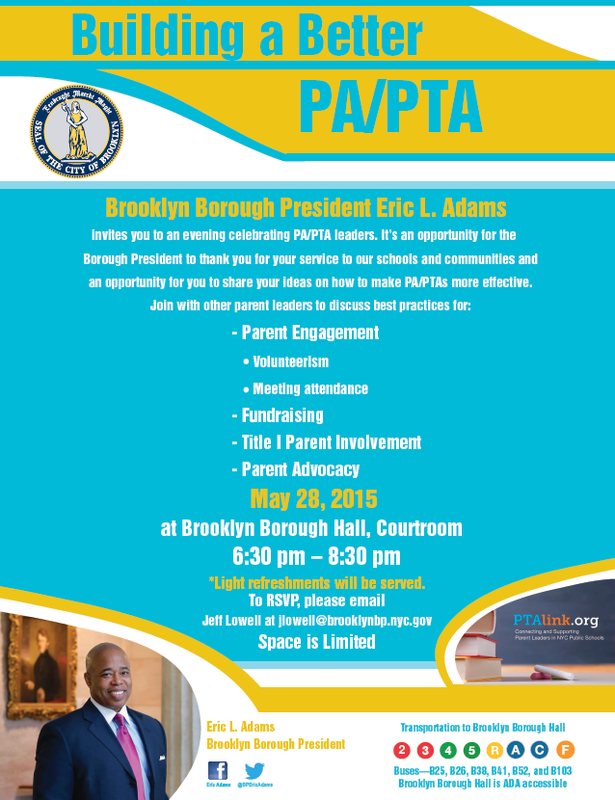 On Thursday evening, Brooklyn Borough President Eric Adams hosts "Building a Better PA/PTA" focused on parent engagement and more. Friday's City Council schedule includes an 11:30 a.m. executive budget hearing for the Committees on Community Development and Youth Services and an executive budget hearing at 1 p.m. for the Committee on Higher Education. City Council Speaker Melissa Mark-Viverito and Council Member Rosie Mendez announced that "the Council will host a "Follow Me Friday" tour of Manhattan's East Village with local business owners, community members, and elected officials on Friday, May 29th. The Follow Me Friday Small Business Crawl will help highlight and promote East Village small businesses recovering from the aftermath of the March 26th building explosion and will begin with a moment of silence at the site of the explosion on 2nd Avenue and 7th Street. The small business tour will begin at 5:30 PM and will include" several stops at cafes, restaurants, and other businesses. On Saturday in the Bronx, a CUNY Citizenship Now event with City Council Member Ritchie Torres and State Senator Gustavo Rivera. Also Saturday in the Bronx, the City's community planning office is holding a public "Visioning Workshop" for "Jerome Avenue Community Planning."